Diamond jewelry is more than just beautiful: with clever design it can be symbolic and meaningful on a personal level. Throughout many cultures, diamonds are enduring symbols of faith and love, meant to reflect the timeless nature of personal commitment. 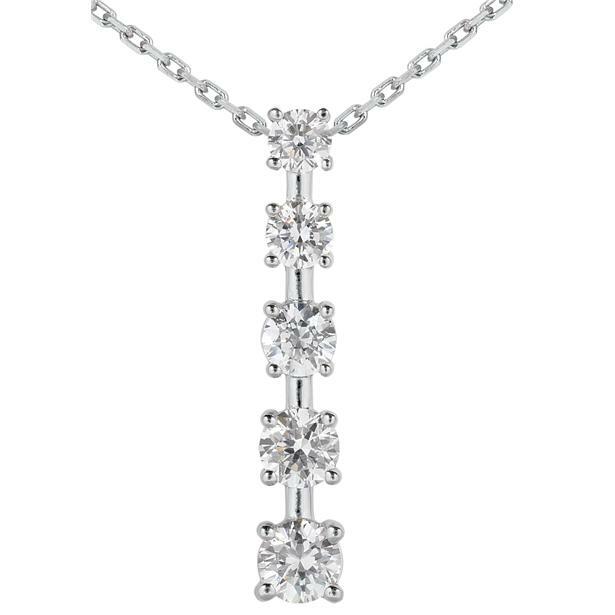 Diamond journey pendants are a variation on a classic design that exemplify the symbolic potential of diamond jewelry. These pendants feature graduated diamonds, each slightly larger than the last, arranged into a straight or curved line. The progression suggested by this arrangement represents love growing through a life spent together. Diamond journey pendants are a smart choice for couples looking to celebrate a long-term relationship or commemorate a special event such as an anniversary. By carefully selecting a pendant, gift-givers can even match the number of diamonds in the journey to the number of years on a particular anniversary. This entry was posted in Beautiful, Diamond, Diamonds, Jewelry, Love and tagged diamond journey pendants, diamond pendants, Diamonds, Love, romance, szul. Bookmark the permalink. Diamonds can be the most valued possession for a life time. Diamond pendants are simply beautiful and they can add zillion dollars to the appearance of any women.